Being dubbed "dangerous" in colonial days was almost as bad as being declared a witch—women who fell afoul of social norms were often killed. So Lady Deborah Moody did what any dangerous woman with her wits about her should: She grabbed a bunch of her friends, left civilization as she knew it, and started her own village instead. Born Deborah Dunch in Wiltshire, England around 1586, the future lady had it much better than many of her contemporaries as the daughter of the man in charge of the Royal Mint. She later married a man named Henry Moody who, like her father, worked hard to elevate himself in a world constricted by inflexible class roles. Her husband became a knight and then bought himself a baronetcy, which earned him a higher place in society, but not necessarily other people's hearts. As sheriff of Wiltshire and a notorious poacher, he made plenty of enemies, and may have made one of Deborah herself when he was accused of illegitimately fathering a child around 1620. When Henry died in 1629, Deborah found herself impoverished. Then in her forties, she was forced to sell much of the family property to pay her late husband's debts. But she found comfort in religion, attending Quaker services in London and becoming a fervent Anabaptist—someone who believed that children shouldn't be baptized at birth, but instead when they were old enough to decide for themselves. This was seen as nothing short of revolutionary at the time, and the word Anabaptist became shorthand for anyone who went against the grain. With her outspoken religious views, Deborah soon found herself firmly in that category. Not only did Deborah have controversial religious views—she also had legal trouble. After moving to London from her country home, a local court forced her back to her hereditary lands "as a good example necessary for the poorer class." Incensed by her lack of physical and religious autonomy, she headed for what she assumed would be a more tolerant place: the American colonies, which were known for their communities of religious dissidents. But when Deborah arrived in Massachusetts in 1640, she realized she had made a mistake. (Perhaps her real mistake was then moving to Salem, which would accuse and prosecute women for witchcraft about 50 years later.) Though she became a member of the Massachusetts Bay Colony and joined the Salem Church, she soon ran afoul of Puritan religious philosophies. Anabaptism was considered sinful there, too, and in 1642 she was admonished for her refusal to believe in the baptism of infants. Not only did her church publicly admonish her, but she ended up being excommunicated. John Winthrop, the colony's governor, was a friend of Deborah's, and wrote in his diary that unfortunately Deborah was "infected with anabaptism," although he also felt she was "a wise and anciently religious woman, being taken with the error of denying baptism to infants." Nevertheless, one of his colleagues summed up the feelings of other colonists when he decried her as "a dangerous woman." Cast out and unwilling to change her views, Deborah moved again, this time to Dutch New Netherland. Once there, she asked Director-General William Kieft if she and some other dissenting friends could move into his colony. After getting the thumbs up, Deborah set up a town on the southwestern tip of Long Island, becoming the first woman to charter land in the New World. 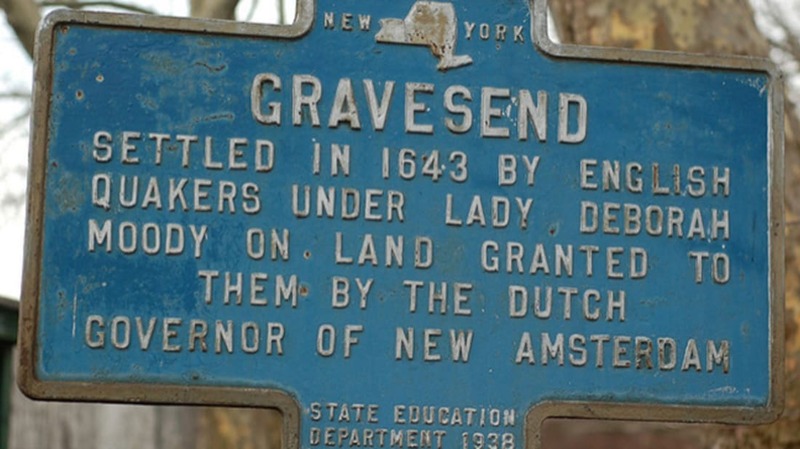 Gravesend, as it was called, was located in what is today Brooklyn, but at the time it didn't resemble much of anything. It also wasn't territory she was exactly free to settle—though Kieft gave her the heads up that Native Americans owned the land, he felt free to disenfranchise them. Deborah initially paid the landowners money, but tensions rose and eventually she was temporarily driven off of the land she had claimed during violent uprisings against Kieft and the settlers of New Amsterdam. Eventually, the settlers fended off their attackers, and Deborah and the surviving settlers moved back to Gravesend. There, Deborah set about an early form of city planning: She divided the village into four perfect squares ringed by a wall, with the land inside the wall subdivided into 10 lots per quadrant, and the land outside divided into triangular farms. All lots were distributed on an egalitarian basis to every male head of household, instead of to the wealthiest and most powerful, as was the common practice in English communities. Deborah lived there until her death in 1659, in a town that finally afforded her the religious freedom she had fought so hard to obtain. More than 350 years later, Gravesend is a neighborhood in south-central Brooklyn near Coney Island, where Deborah's street grid is still being used—a testament to the fact that sometimes being a dangerous woman is a very good thing.